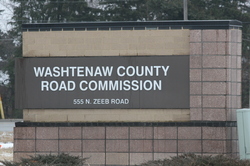 Posted on Mon, Mar 19, 2012 : 5:57 a.m.
Five possible projects on roads in Sylvan Township will be the focus of a discussion between township officials and the Washtenaw County Road Commission Monday at Township Hall. In deciding which road projects can be completed in 2012, the township has $233 less in matching funds to utilize for local roads because there are fewer uncurbed miles under the jurisdiction of the Road Commission this year compared to last year. Officials will discuss how township officials want to use $13,363 in matching funds and $11,489 in drainage matching funds. In addition, there is a carryover of $11,489 in matching drainage funds that can be utilized. In 2011, the township spent $17,371 on local road projects, including three solid applications of dust control on 28.07 miles of gravel roads in the township. In total, the township saw $541,147 spent on road projects, including the following major projects on primary roads: the overlay of Old US-12 from M-52 to Freer Road, crack seal and chip seal on Old US-12 from the county line to Wilkinson Street, and on Bush Road from Pierce Road to Sibley Road. Winters Road from Kalmbach Road west about a half mile — reshaping the surface and the addition of about 1,100 tons of limestone at an estimated cost of $14,500. Kalmbach Road from Garvey Road north to I-94 — reshaping of the surface and the addition of about 750 tons of limestone at an estimated cost of $9,900. Garvey Road from Cavanaugh Lake Road to Pierce Road — reshaping of the surface and the addition of 1,950 tons of gravel at an estimated cost of $19,700. Notten and Reiman roads — berm removal and restoration of the roads at an estimated cost of $7,000. Jerusalem Road from M-52 to the township line on the seal coated section — berm removal and restoration work at several locations at an estimated cost of $6,800. Last year, the township chose to apply three solid applications of dust control on roads throughout the township with one solid application cost of about $10,273. The officials will meet at 1 p.m. at Sylvan Township Hall, 18027 Old US-12. Lisa Allmendinger is a regional reporter for AnnArbor.com who also covers the Washtenaw County Road Commission. She can be reached at lisaallmendinger@annarbor.com. Mon, Mar 19, 2012 : 7:10 p.m. It sure would be nice if the township would do something about the terrible condition of cavanaugh lake rd. One has to go into the other lane or take the chance of having the cars aligenment messed up and if a car is coming or there are bikes in the lane it leaves for a dangerous situation. It has been years since something has been done and done right to this road. Let the township know that all us residents pay taxes and this is far more dangerous than some dust control, just my opinion. Mon, Mar 19, 2012 : 1:48 p.m. Thank you for including the costs of these projects, it could give your readership an understanding of how expensive it is to keep our roads in -decent- condition.